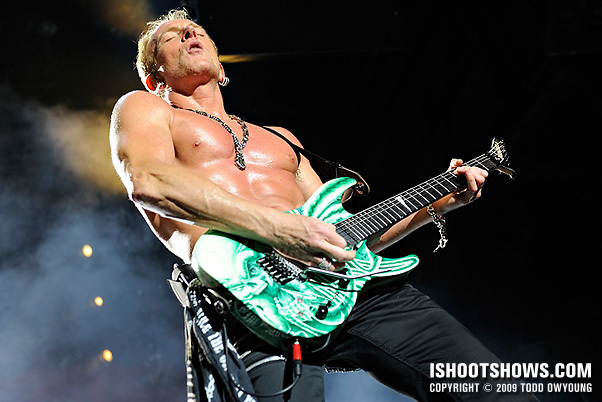 July 20, 2009 – Playing the Verizon Wireless Amphitheater to a rowdy, grinning crowd of die-hard fans, Dep Leppard showed off why they were among the titans of the New Wave of British Heavy Metal. We had two songs to make it happen for this concert, and despite the shorter allotted time down from the standard “first three,” Def Leppard put on a great show that made covering this concert easy a lot of fun. 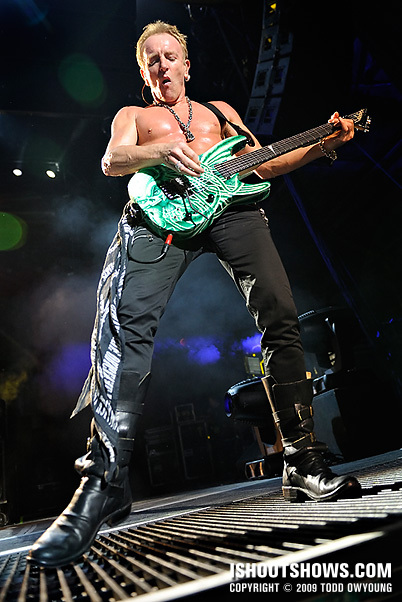 In particular, guitarist Phil Collen was a great subject stage left and came to the front of the stage on multiple occasions to play out for the fans, complete with a very studied and finely honed guitar face. 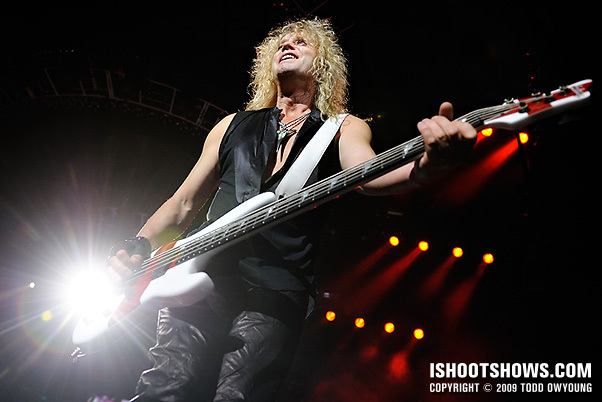 On either side of the stage there were small rectangular extensions setup in front of Collen and Rick Savage, bringing them out into the photo pit and that much closer to the crowd. 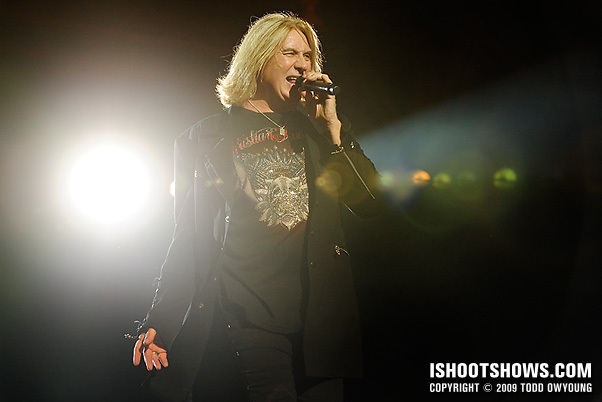 Frontman Joe Elliot made ample use of the stage and was a moving target throughout the first two songs, both on the catwalk and on the main stage. The lighting for this concert was the modus operandi for a tour like this; spotlights on the players and generally good effects all around. While the two songs went by a blazing speed, the nice lighting made making the key shots a relative breeze. Update: I should note that while the lights were great, be prepared to do a lot of footwork if you want to catch Joe Elliot. Phil Collens is the easy one; Joe makes you work for those shots. 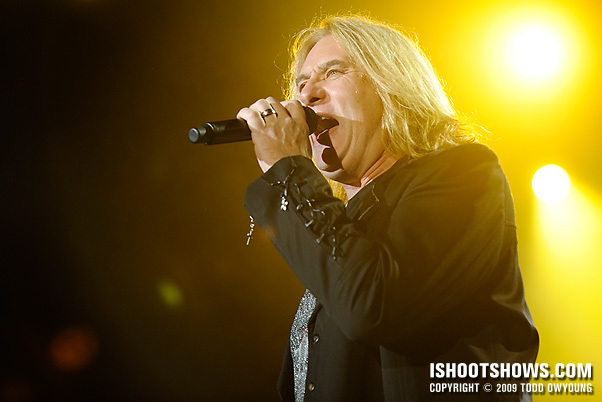 Due to the setup, I used the Nikon 70-200mm f/2.8 for most shots of Joe Elliot, while the Nikon 24-70mm f/2.8 and Nikon 14-24mm f/2.8 took turns on the guitarists. Great stuff as always Todd, but where is Vivian Campbell? Hey Kevin, thanks for the comment. You know, that is a very fair question, and the answer is that I missed Vivian. I should say that this was an “easy” shoot with some caveats, the main one being that while the shoot was facilitated by good lighting, there was a ton of hustle involved. 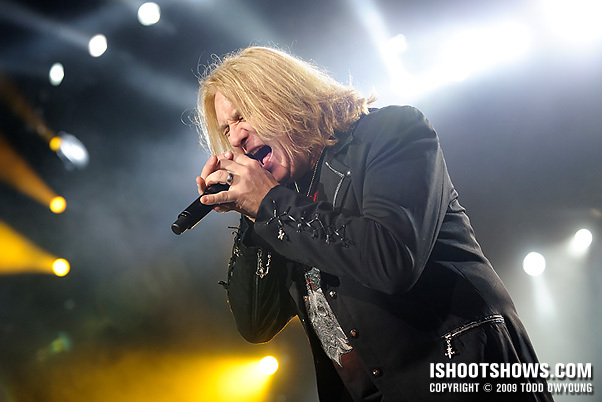 Mainly because of Joe Elliot and his constant movement on stage, which ate up a lot of the two songs. Thanks for bringing up the point of missing Vivian Campbell. I should make a correction: this concert wasn’t really easy, but if you want to work for it the lighting was great and the band was rockin’. Hey thanks Todd. I will be shooting them later this month and am looking forward to it. I got worried that maybe Vivian wasn’t there..lol. Thanks for the notes, that really helps. Was the barricade all the way across the stage or was it split like Aerosmith’s? Ahh, in that case, have fun! This shoot really did go by very quickly, but don’t let that scare you. The barricade is split, so you’re going to have to pick your side. One reason I missed Vivian is because he was playing a bit farther back stage right, and I was setup stage left (house right). Rick Savage and Phil Collen did switch it up at one point, but I think Vivian was hanging back. For Poison, you’re going to have to pick between Bret and C.C. as far as which the best side is. Of the two, Poison was a lot easier to shoot than Def Leppard, though Poison has more haze and tricky lighting. Vivian was hanging out stage right (house left), so go to that way if you want to catch him. Same with C.C., he’s stage right as well and plays up at the front of the barricade a lot, so you should be able to get some great shots. Bret was my main goal for Poison, so I chose stage left because those angles are a bit more clear to me with Bret. I didn’t catch Cheap Trick, unfortunately. Kind of bummed, as I heard they had some nice lighting. Incredible as usual. So you got Poison and Def Leppard….how about Cheap Trick for the trifecta? Were you able to shoot the boys from Rockford, too? Hey Clayton, thanks for the comment. Alas, no Cheap Trick! I would have liked to catch all three, as it’s a great bill, but maybe next time. #1 really has some guts, nice set. Hey Andreas, thanks – the lead shot is one of my favorites from the concert. Beautiful shots! You captured Def Leppard in all their glory! Hey Angie, thanks very much. That’s always what I want to hear, that I captured a band for their fans! Shot 15 ! !…I’ve found Vivian standing behind Phil !!! Do I win a prize ?? 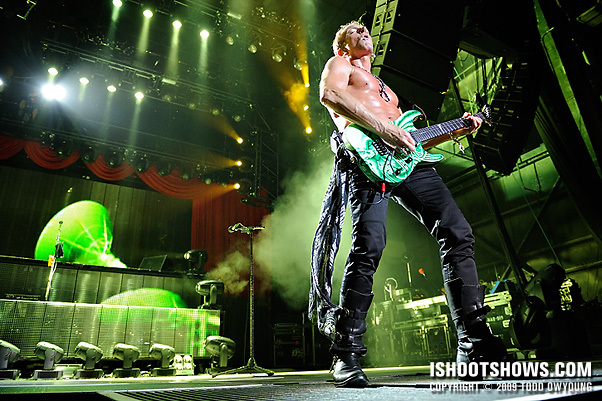 LOL !Amazing shots of Leppard,Todd.Well done. Your shots are gorgeous! 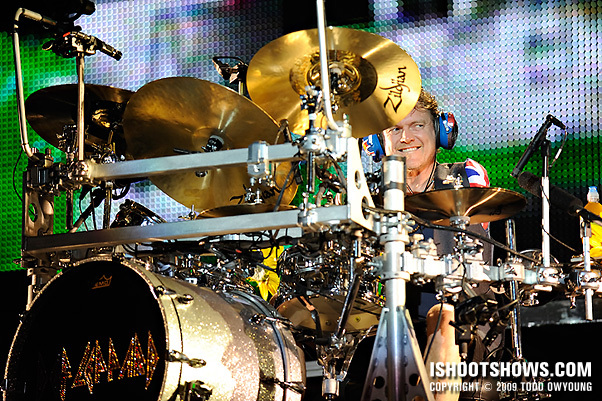 Especially the one of Rick Allen – the colors are brilliant and the sparkle on the bass drum is killer. It’s a shame there aren’t any other shots of him – was he as difficult to capture as Joe?